A war of words has broken out between Moscow and Washington over a suspected chemical attack in a Syrian rebel-held town, as calls grow for an international response to the incident amid an urgent UN Security Council meeting. Rescue teams and medics have said a "poisonous chlorine gas attack" in Douma on Saturday killed dozens of people, including many children and women. The Syrian government of President Bashar al-Assad and its ally Russia have called the allegations "fabrications". As the fallout continued on Monday, US President Donald Trump pledged to soon announce "major decisions" over the attack, while his Russian counterpart, Vladimir Putin, warned against "provocation". In a statement, the Kremlin said Putin had held a phone conversation with German Chancellor Angela Merkel, during which the two "leaders exchanged opinions on the situation in Syria, including the accusations against Damascus by a number of Western countries of using chemical weapons. "The Russian side stressed the unacceptability of provocation and speculation on this matter," the Kremlin added. For his part, Trump condemned what he called a "heinous attack on innocent" Syrians in Douma, as he opened a cabinet meeting at the White House, adding that decisions would come in the "next 24-48 hours". "This is about humanity; it can't be allowed to happen," he said. Earlier, Trump and French President Emmanuel Macron had vowed a "strong, joint response", while Jim Mattis, the US defence secretary, said nothing was off the table in terms of military action. 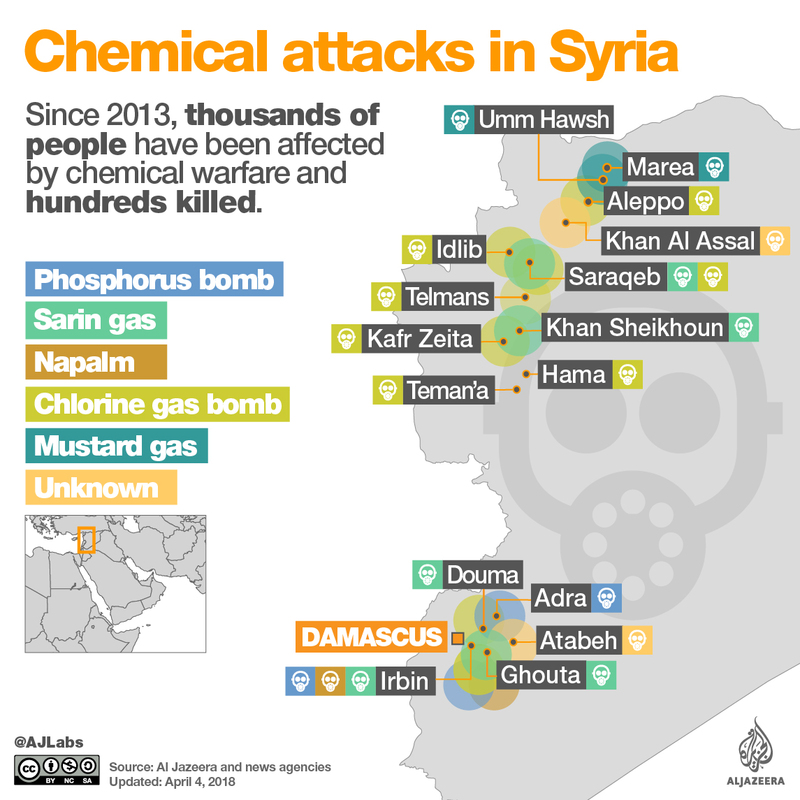 In April last year, Trump ordered air raids on Syrian government facilities in the wake of a chemical attack in Khan Sheikhoun , a rebel-held town, which killed at least 80 people. "The question now is whether the president will have a similar reaction after seeing similar images coming out of Douma," Al Jazeera's Kimberly Halkett, reporting from Washington, DC, said, adding that several emergency meetings with military and political advisers were taking place in and around the White House on the matter. On Sunday, Trump warned Iran and Russia that there would be a "big price to pay" for backing the "animal Assad". 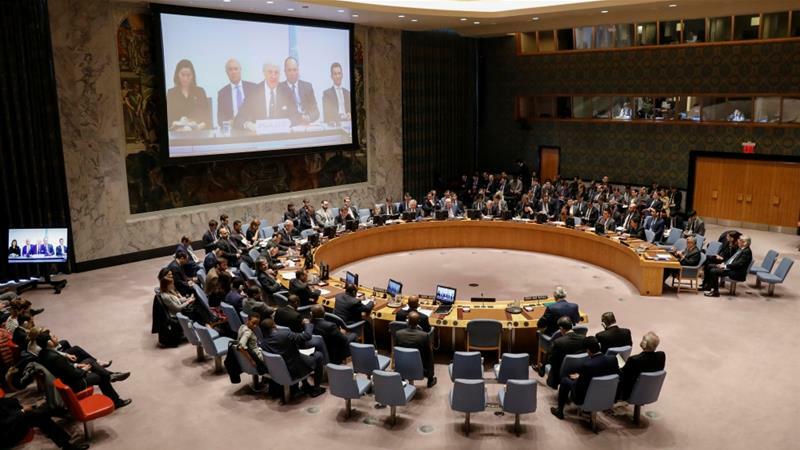 The crisis was due to be discussed later on Monday at the Security Council, with the US circulating a draft resolution for a new independent inquiry of chemical weapons attacks in Syria. Theresa May, the British prime minister, said on Monday that the Syrian government "and its backers, including Russia, must be held to account" if it is found to be responsible for dropping chemical weapons on Douma residents. But Kremlin spokesperson Dmitry Peskov warned earlier in the day that "making any deductions is wrong and dangerous". Peskov suggested that rebels could have staged the attack themselves to pin the blame on Damascus, something that Russia has recently warned could happen. "Both the president and the defence ministry, citing intelligence sources, have spoken about such a provocation being prepared," Peskov said. He added that this could mean the rebels carried out an attack using chemical weapons or spread rumours of such an attack. Sergey Lavrov, Russian foreign minister, said Russian specialists had found no trace of a chemical attack on Douma. The heated exchange of remarks also came after missiles struck a Syrian airbase in Homs province earlier on Monday, state media reported, with Russia and Syria blaming Israel for carrying out the attack. Two Israeli fighter jets, using Lebanese airspace, fired eight missiles at the T-4 military airbase, the Russian military said, but offered no further information. The attack at the airbase, located 40km west of Palmyra, killed and wounded several people, Syrian state news agency SANA reported, citing an unnamed military source. Israel has not responded to the accusations.